By Carson Phillips--During the evening of October 9, Koerner Hall was resplendent with a musical concert from the Grammy-nominated ARC Ensemble (Artists of the Royal Conservatory). The program honoured the contributions of Holocaust survivor educators in Canada, many of who filled Koerner Hall for this special evening of music and commemoration. The program, organized by the Sarah and Chaim Neuberger Holocaust Education Centre, UJA Federation of Greater Toronto, was presented in partnership with the Government of Canada, and the Federal Republic of Germany. It was the premiere cultural event of the International Holocaust Remembrance Alliance’s conference that took place from October 6-10, 2013. More than 200 international delegates from 31 countries experienced works by Paul Ben-Haim (née Paul Frankenberger) and Aldo Finzi, Jewish composers whose careers were forever altered by the Holocaust. Another highlight of the program was the poignant keynote address delivered by the Honourable Madam Justice Rosalie Silberman Abella. Born in a Displaced Persons Camp in Stuttgart, Germany, Justice Abella honoured the memory of those killed in the Holocaust as well as the survivors who immigrated to Canada. Speaking with both personal understanding and historicity, Justice Abella received a standing ovation for her poignant and moving address. The audience also heard from Minister Jason Kenney, Minister for Multiculturalism who presented a teaching award for excellence in Holocaust education to Scott Masters a teacher at Crestwood Collegiate, Mark Adler M.P. for York Centre, and Walter Stechel, Consul General of the Federal Republic of Germany. 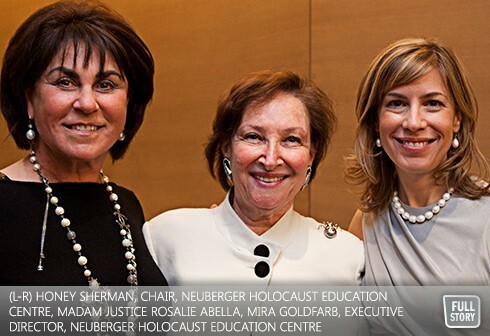 While the evening was a signature event of the Canadian Chair year of the International Holocaust Remembrance Alliance, it also provided a glimpse into the calibre of programming that will be take place during the Neuberger’s upcoming 33 Annual Holocaust Education Week. Through this world-class educational event, the Neuberger Holocaust Education Centre continues to generate knowledge and understanding about the Holocaust and serves as a forum for dialogue about civil society for present and future generations. This year’s Holocaust Education Week program focuses on National Narratives and takes place from November 3-9 and is available at www.holocaustcentre.com.